Redrock in Brodick, Isle of Arran, Ayrshire sleeps 8 people. 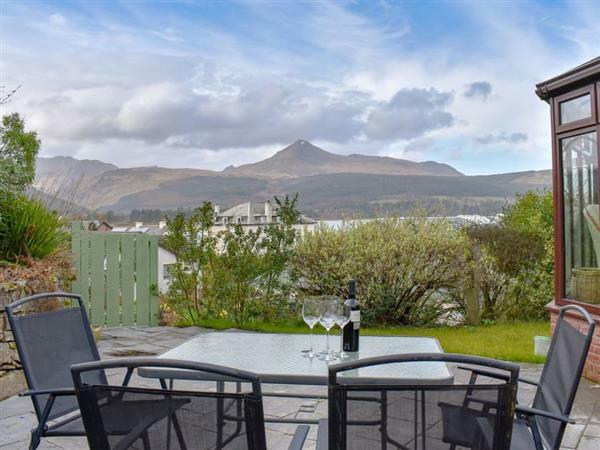 Redrock in Brodick is centrally located; Redrock is in an elevated position, with fabulous mountain and sea views from the large panoramic window, including Goatfell and Brodick Bay. 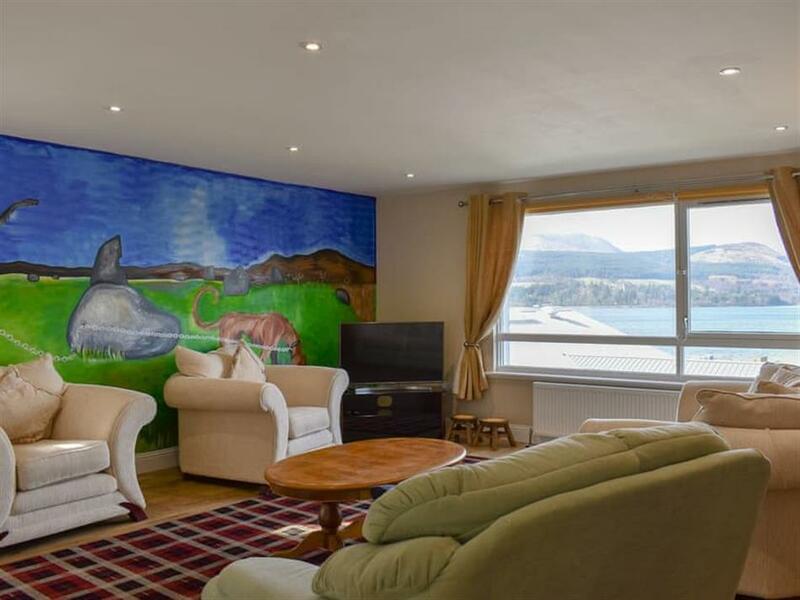 To give a real sense of being on Arran, a mural of the Machrie Standing Stones, depicting the folklore tale of the famous Machrie Moor dog, has been painted on the living room wall. The bright and spacious conservatory with doors opening out to the patio is the perfect place for guests to relax and take in the views, whilst enjoying the Arran sun with a glass wine or dining al- fresco. Three of the bedrooms have modern en-suite shower rooms whilst the other has a Jack and Jill bathroom also accessible from the hall. Brodick is the main village on Arran and the ferry terminal is just a 5 minute walk from the property, making this a perfect base for those who may want to travel by foot. Shops, bars, restaurants, café, beach, mini golf, golf club and children’s play park are all within walking distance, with leisure facilities available at Auchrannie Resort at the other end of the village. The beach is 50 yards from Redrock in Brodick. With the shop 50 yards, the pub is 100 yards and the restaurant is 20 yards from Redrock. Living area: With electric fire, 42 Freeview Smart TV and DVD player. Conservatory: With electric fire and patio doors leading to patio. Bedroom 4: With twin beds and en-suite with shower cubicle and toilet (also accessed from hall). Oil central heating, electricity, bed linen, towels and Wi-Fi included. Travel cot and highchair. Patio with garden furniture. Private parking for 4 cars. No smoking. Please note: There are 4 steps to the patio and sloping banks from the paths. Holidays at Redrock run from Monday to Monday. For a better idea of where Redrock is, you can see Redrock on the map below. You can find more large holiday cottages (that's cottages which sleep 8 or more people) in Wales. If you want to see more large cottages, have a look at large cottages in Wales. Do you want to holiday near Redrock (UKA459), you can see other cottages within 25 miles of Redrock; have a look to find your perfect holiday location.